Flunch is a sort of fast food canteen chain in France. I was introduced to it by husband who used to eat at Flunch when he was a student. He especially liked their hamburger steak (i.e. served like a piece of meat, not in a bun), or steak hache as it is known here. When we were in France for our 3 week honeymoon we couldn't possibly eat at restaurants every meal otherwise we would have gone broke, so we ate at places like Flunch sometimes to keep costs down. The modus operandi is as follows: Take a tray, then select your drinks, dessert, cheese, salad etc and for the main course you go to the hot stations manned by dinner ladies. Steak hache and whatever grilled meats of the day is cooked at a separate section. Then you go over to the cashier and pay for your meal, find a table, help yourselves to cutleries, condiments etc and eat. I remember they used to serve side dishes like fries, carrots, pastas in a long tray-table that people could help themselves too. I used to go back again and again for the creamed spinach, my record was at the Avignon outlet where I ate 5 plates of creamed spinach! I went back again the other day when I was shopping at Forum des Halles. For nolstagia's sake. 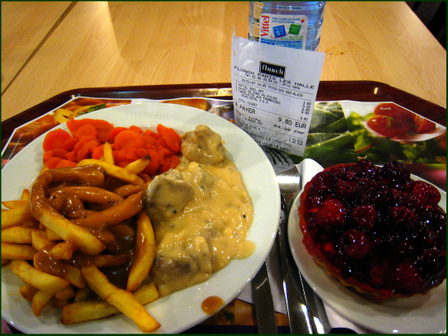 And found that the prices are still low, the daily set was 7.60 Euros which I would have qualified for if I had chosen the day's dessert of chocolate mousse instead of the huge tart that I couldn't finish in the end. The food was still the same, the taste of institution mass catering food, of canned vegetables and meats of dubious origins. Unfortunately they have stopped letting people help themselves to things like creamed spinach, the dinner ladies dish them out with the main course orders. Creamed spinach was not available, I settled for carrots and fries. The pork in pepper sauce was cold by the time I sat down, it was soft and not palatable. But I had the foresight to drench my fries in masses of the brown poivre (pepper) sauce that is laid out on the condiment table, presumably it is for the people who ordered steak hache; the brown sauce was very tasty and in no time at all I had polished off the fries. I took the photograph to show husband, he says he doesn't mind going back to relive old memories. He even has good things to say about the McDonald's here. OKie, but maybe not so soon yes?